Serpent and Dove continues to take the lead in magnetic innovation with this revolutionary new grate magnet. In keeping with its motto, ‘Finding ways with Magnets’, Serpent and Dove has patented the ‘Acti-Grate’ system in which the tubes of a grate magnet ‘float’ and become activated by the flow of product around and between them. Grate magnets are used extensively throughout food, chemical and plastics industries to remove iron contamination from products. As some powdered or granular products may bridge and tend to block conventional grate magnets, the new system obviates the additional cost for using external vibration to assist product flow. 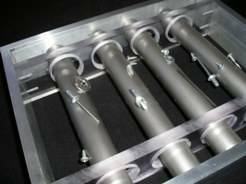 In the ‘Acti-Grate’ system, each of the grate magnet tubes rests at each end on a fine edge within a larger diameter hole that allows the tube to float and be ‘live’ within limits. Product flowing over and between the tubes moves them enough to help prevent hang-ups and bridging.